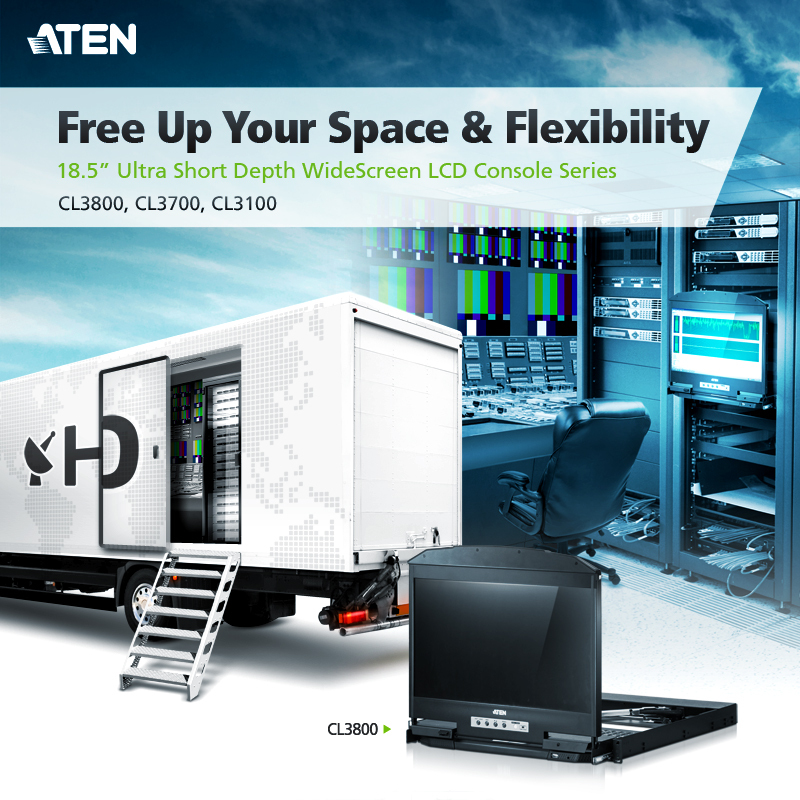 Sydney, Australia (April 30, 2018) – ATEN ANZ PTY LTD., a subsidiary of ATEN International Co., the technology leader and global manufacturer of KVM and Pro AV connectivity solutions, today introduced the first in its new series of 1U 18.5” Ultra Short Depth Widescreen LCD Consoles. The ATEN CL3800 features industry-leading 45cm ultra short depth and a unique dual-rail design, supporting all popular video input interfaces to ensure the maximum flexibility while saving valuable space. The new ultra-short depth series provides a space-optimizing solution for specialized control environments, including outside broadcast vans (OB vans), portable rackmount cases or any computer room where space is at a premium. Industry Leading 18.5” 45cm Ultra Short Depth: The CL3800 features an industry-leading ultra-short depth design in a 1U 18.5” dual-rail LCD console. It is especially suitable for shallow racks down to 45cm depth and saves valuable space in computer rooms where space is at a premium. Ultimate Space Saving for Constant Monitoring: The dual rail design enables the LCD monitor, keyboard and touchpad to operate independently of each other. To maximize space utilization, the keyboard and touchpad modules can slide back to "hide away" when not in use, while the thin profile LCD monitor rotates back, flush against the rack, to allow the 24/7 monitoring of computer activity. Second Console for Flexible Deployment: For added convenience, users can choose to manage the computer from an external console. The CL3800 features a port for an external USB mouse on the unit’s front panel, while ports for the second KVM console (USB keyboard/mouse and HDMI, DVI, or VGA monitor) are provided on the rear panel. Supports All Popular Interfaces, HDMI, DVI, VGA: The CL3800 provides the ultimate installation flexibility by allowing users to connect the console and the computer via any of the three types of the video source. Superior Widescreen Monitoring Image: The 18.5” widescreen LCD monitor ensures 16:9 video ratio and provides ample viewing area. Optional models for full HD monitor to fulfill the high-quality image demand. For more product information, please visit the CL3800 product page. For more ATEN updates follow us on social media!